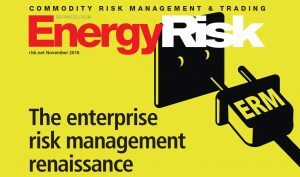 Recently EnergyRisk published two articles on enterprise risk management (ERM). Utility firms use various kinds of risk assessment in their trading and commercial operations. Today’s circumstances however are demanding a more comprehensive risk overview. 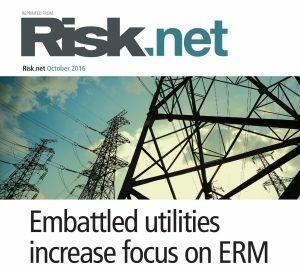 The November 2016 issue of Energy Risk features an article on ERM (Enterprise Risk Management), explaining why electrical utility companies in Europe and the United States are rediscovering this tool. “Faced with plunging revenues, rising costs and shrinking margins, utilities must eke out as much value as possible from every part of the business.” reports author Stella Farrington. According to Energy Risk, the current use of ERM should make a transition. Instead of taking only a statistical and quant-based approach, it should transform into a holistic view of risks that are affecting an organisation. The articles quotes Cyriel de Jong from KYOS “We see many firms still operating in silos”. Adding the VaR of two trading departments together can be misleading as the risks tend to be non-linear. That combined with the tendency to focus on short term risks make the need for ERM even greater. “The largest risks are usually in the longer term. But the further out you go the more difficult it is to assess risks.” It is worth to try however and see which portion you can hedge to minimize these long-terms risks. A similar article about ERM appeared in October on risk.net, but focusing on the need to use ERM in a broader sense. The use of ERM has to move on – do not use it for regulatory compliance only, experts say. Cyriel de Jong: “With a few exceptions, ERM is not well developed in most energy firms. Many companies would now like to make improvements to their existing functions”. To read the full articles: please click here for the one of magazine Energy Risk and here for Risk.net. More information about KYOS’ risk management solutions can be found here. Or contact Cyriel de Jong with a message on our contact form.